Celebrities have reacted to Cee-c emerging second and Miracle eventually winning the 2018 edition of the Big Brother Naija show. 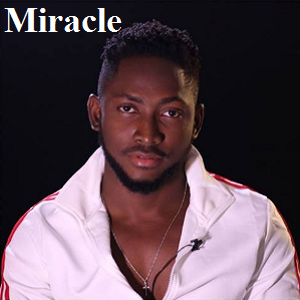 Miracle emerged winner of the 25 million Naira grand prize on Sunday, beating Cee-c, Tobi, Nina and Alex. Miracle had 38.18%, Cee-C 28.04%, Tobi 22-54%, Alex 7.07% and Nina 4. 18%. Miracle won 25 million Naira in cash, an SUV worth 12 million Naira, a trip for 2 worth 4.7 million Naira and home equipment worth 3.3 million Naira. At the grand finale, he also won one million Naira for having the total shortest time for the Payporte games.